Golf Carts: Fairway or Rough? The winning team, by a record margin: Chic, Gary, and Doug. Second hole, November 4, 2012. Beginning November 1, the Sunday Morning Group gives an extra handicap stroke to anyone who wears shorts. Chic and Doug both did this morning—and Doug didn’t wear a hat, and after a few holes he took off his jacket—even though it was 35 degrees when we started. We had three threesomes, and we played two best balls, net, off the low handicap, which was four. Chic and Doug ended up on the same team, along with Gary, our superintendent, but the extra strokes were meaningless because they shot 12 under, which was 16 shots better than the second-place team (mine). That’s a record, as far as anyone can remember. Incidentally, the Sunday Morning Group’s record worst round is 9 over par, net, on one best ball; it was set on October 22, 2001, by Frank D., Rick, and me. November 1 is also the day the golf shop closes for the year, and that means no golf carts from now till spring. 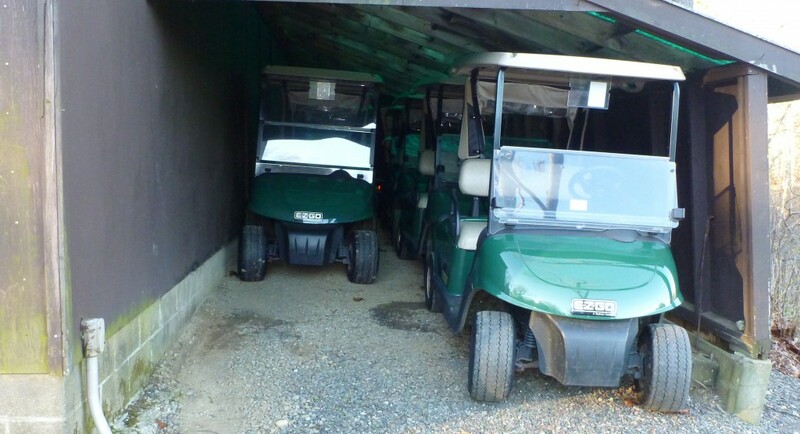 (The carts are stored for the winter in a building behind the ninth green which somehow survived Hurricane Sandy—see the photo below.) The course always looks great once the carts have been put away, because there aren’t tire tracks running everywhere. Thinking about that made me think about an unresolved controversy at many clubs, including mine: do golf carts do more damage on fairways or in the rough? Gnarly old rough seems “stronger” than manicured fairways, but cart tracks are usually harder to see in short grass than in long. I’ve played courses where players were told to keep their carts off the fairways, and I’ve played others where they were told to keep them out of the rough. Several years ago, I asked Stacy Bonos, an agronomist in the Turfgrass Breeding Project at Rutgers University, who was right. She hesitated, but when I pressed her she said that, all in all, carts probably probably did less damage to fairways than to rough. No more carts till spring. This entry was posted in Games, Golf Courses, Sunday Morning Group, Weather by David Owen. Bookmark the permalink. I’ve heard that the issue is the grass type, rather than the generic fairway or rough. Apparently carts do more damage to fescue (typically a rough grass) than typical fairway grass (whatever that may be). My club is almost exclusively walking, and our fairways and rough are both fescue. Where to drive is a source of controversy on the rare occasion a cart is used. What is this grass in the rough you speak of? Many courses in West Texas prohibit carts in the rough in hopes of extending the useful life of the cart. Now you’ve got me. Some kind of fescue? I’m not even 100 percent sure what kind of carts we have. I must say that a good many of golf cart drivers seem to ignore all rules, and go wherever they want. I personally do not like carts, especially the petrol powered ones, too noisy. I think the USA is the only country where it is compulsory to use a cart, you can not elect to walk the course. These clubs are happy for Professionals to walk the course, why change the rules for us.